What Josie Did Next: FASHION | Colour Blocking? Just a couple of quick shots before I had to dash out. As you can see my camera is now on its last legs and after months of saying how I need a new one I think I may have to finally ask Father Christmas this year. Although I'd rather buy my own, I don't want to ask for anything expensive when I'm making my own money and am perfectly capable (with a lotta willpower!) of getting it myself if I save. I think I'd like a bridge camera but I'm gonna have to do a bit of research (aka Google) to find something not too pricey and simple enough for a divvy like me to get the hang of. Anyway, what the camera didn't capture was the colours in this outfit. 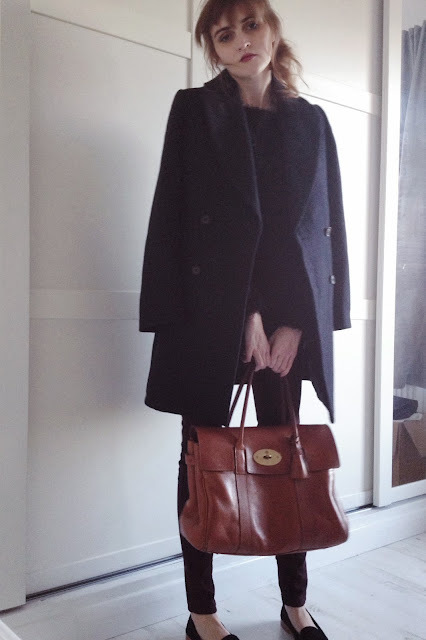 The famous coat that all the bloggers (and their mothers too, eh Izzie??) have is navy and the trousers are a really deep burgundy. I'm not one for colour blocking because I'm too much of a wimp but when the shades are dark I think I can handle it. The trousers are H&M, they were so bargainous at only £14.99 but fit like a dream and seem well made, like most of H&M's denim and trews. Worn with berry lips, I think they're nice for Autumn. And yes, I'm doing that really irritating thing with my coat here but trust me, it's flippin' cosy. Don't knock it til you try it! I'm sorry about the zombie face by the way, I'm gonna warn you now to expect a lot more butterzness like this in the coming months...CF and Winter do not get along so until we see the sunshine again I'm gonna be feeling pretty wiped out! Love this outfit, Josie. That coat is everything. Hope you feel better soon and it warms up for you-I think you look gorgeous, and that bag <3 :) Oooh I'm after a bridge camera too, I saw a decent one the other day for about £140 but rather annoyingly I can't remember what its name was! You are pure class in this polished outfit, love the coat Josie, no wonder its so famous! love your look!!!! 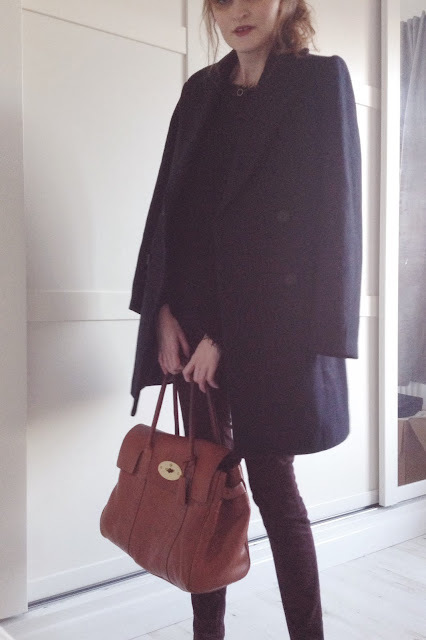 the coat, the bag, everything!